Locking Phases and Natural Oils! Haven’t posted alllll week…did you’ll miss me?! 🙂 Today I wanted to write some more about my Sisterlocks. Prior to making the decision of getting Sisterlocks I wanted to know as much as I possibly could about the process of locking and what oils are great for natural hair. I honestly want my journey as natural as possible. Upon my research I came across the 2 pictures below. They basically speak for themselves. The first explains the stages of the locking journey. 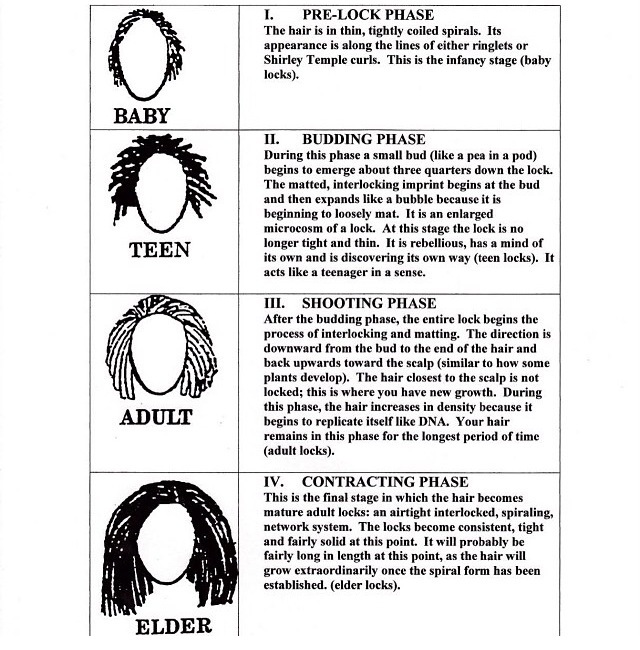 I found it to be quite helpful because I can actually know what ‘stage’ my hair is in at different points in my journey (I’m in phase 2 btw). The second photo explains the best oils for natural hair. We woman can be product junkies…OH I DEFINITELY DON’T MISS THOSE DAYS!!! So it’s great to know of products that will help bring moisture and shine to my locs. Right now I am not able to use any oils in my scalp but I am happy to have done research about what natural oils will potentially work best. I hope all of this info helps some of you! If you have any other natural products that you use that you find quite helpful please feel free to share! This One’s For You Mommy! !